Agates are a member of the Chalcedony family of semi precious gemstones. Chalcedony (kal SED' nee) is any form of microcrystalline quartz, where the crystals are too small to be seen without high magnification. However, in the rock world, only the translucent or transparent, single color types are sold as "chalcedony". 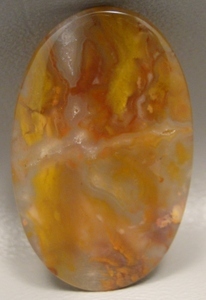 Most of the other stones fall under the agate or jasper category. Agate is defined by its translucency (ability to see light through it), and by its clearly defined pattern or banding of multiple colors. Agate was named from where it was first found - by the River Achates (now called the river Drillo) in Sicily. 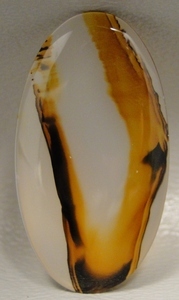 Agates are found all over the world, with certain colors or patterns unique to particular localities. All Agate cabochons take an excellent polish, are trouble free to care for, and hardy enough for all jewelry uses. They have a hardness of about 7 on the Moh's Scale. 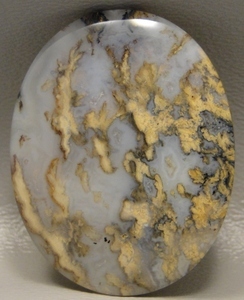 Most Agates are named after their colors or their appearance, or from where they are found. Crazy Lace Agate and Moss Agate are named for their appearance. Brazilian Agate and Montana Agate are both named for their locality. In many traditions agate cabochons are believed to cure the stings of scorpions and the bites of snakes, soothe the mind, prevent contagion, quiet thunder and lightning, secure the favor of the powerful, and bring victory over enemies. At BarlowsGems we specilize in rare and unique agate cabochons. We travel the world looking for striking patterns and bright colors. 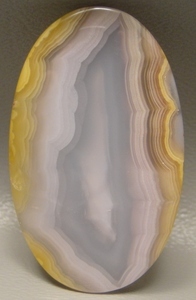 We personally orientate each agate cabochon to get the best possible pattern. Each agate cabochon is hand cut and polished. Please check out all the cabochons we have by exploring our store. You can click on a specific agate category from the list on the left or you can search for specific shapes or colors too.